(TORONTO, ON – November 5, 2015) Experience a feeling of limitless power, perfectly balanced with incredible responsiveness. Whether doing hot-laps on track on the weekend or ruling the road on your daily commute, the Lexus RC F is ready for anybody who wants to immerse themselves in pure driving pleasure. The rear-wheel-drive RC F, recently named the #1 coupe between $50-100,000 for 2016 by Le Guide de l’Auto (The Car Guide)’s annual Best Buy Awards, includes many features designed to deliver track-worthy performance and handling with chiseled sports styling. From first sight, it’s clear the RC F is engineered to be a performance machine – with a low, wide and long body, and deep, sweeping lines riding on massive tires mounted on exclusive 19” forged aluminum wheels. Cooling ducts and outlets express the RC F’s dynamism while performing essential cooling and aerodynamic functions. At the rear, a four-link active rear wing maximizes aerodynamic performance at higher speeds. Inside, the cabin complements the RC F’s aggressive exterior styling with a driver-focused cockpit-like design that emphasizes ergonomics and driving dynamics. This isn’t a car you ‘sit’ in - it’s a car you ‘position yourself’ in. The RC F is fitted with several components unique to the model – including the meters, steering wheel, seats, ornamentation and pedals. A digital stopwatch makes timing laps easy, while a G meter and torque distribution meter provide valuable feedback. The hood is raised to accommodate and emphasize the RC F’s 5.0L V8 engine. Generating up to 467 horsepower, this is the most powerful V8 in the Lexus lineup – capable of delivering instantaneous torque. This engine is mated to an eight-speed Sports Direct Shift transmission – uniquely tuned to deliver a more linear response to accelerator pedal operation and fitted with steering wheel-mounted paddle shifters. Meanwhile, the RC F’s suspension, braking, steering and other dynamics systems were engineered to deliver optimum grip and handling agility. 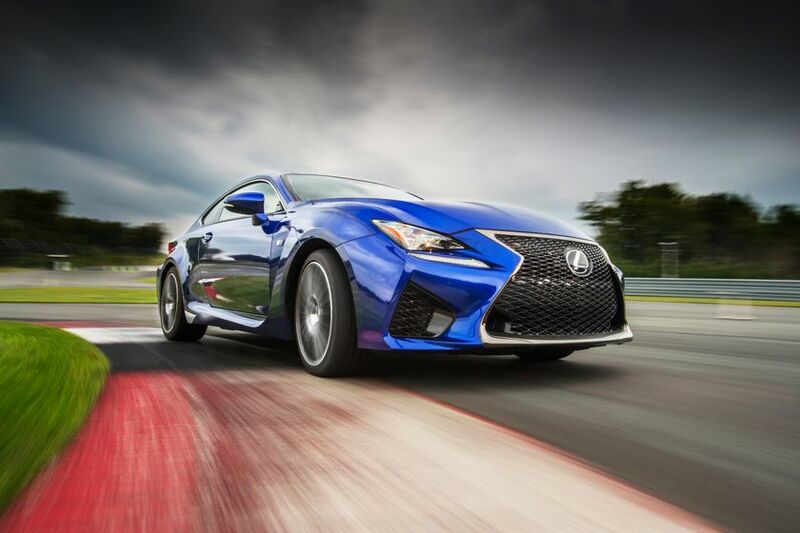 The 2016 RC F (starting MSRP: $$82,750) is fitted with many performance enhancing features. These include a uniquely tuned sport suspension, Brembo brakes, 19” wheels with performance tires, speed-activated rear spoiler and more. Other notable standard features include the Lexus Active Sound Control system, radar cruise control, rain sensing wipers, leather seating, heated and air conditioned front seats with seat memory systems, an interior LED illumination system, Blind Spot Monitor and Rear Cross Traffic Alert systems, Lane Keep Assist, the Lexus Pre-Collision System, intuitive parking assist, the Smart Key system, Push Button Start, Lexus “L” motif LED headlamps enhanced with the automatic high beam function, clearance and back-up sensors, a Mark Levinson Audio system, Navigation system with 7-inch screen, a power moon roof and more. The 2016 RC F may also be ordered with the available Performance Package. This adds a Torque Vectoring Differential, unique 19” forged wheels, carbon fiber trim, carbon fibre active spoiler and a carbon fiber roof (without moon roof) to reduce vehicle weight and lower its center of gravity. The 2016 Lexus RC F is now on sale at Lexus Dealers across Canada.